Marriage*: He married Ann Geraghty. (informant) Death: He was an informant on the death certificate of Michael J. Madden on 27 July 1936 at Chicago, Cook County, Illinois, USA, at age 65; His death certificate states he died by asphyxiation from drowning after jumping into the Chicago river. His body was found at the north branch of the Chicago River at Western Avenue. An inquest was held and it was determined it was a suicide while temporarily insane. On FAG it additionally reports: His family notes that he was in extreme pain from incurable bone cancer. His funeral was held at Queen of Angels Church and he as buried at All Saints Cemetery. Madden -- Michael J. Madden beloved husband of the late Mary, nee McNulty, fond father of Thomas, Sarah, John and Cecille Heidkamp, brother of William, Mrs. M. Ginty, Mrs. J. shannon, the late Patrick and Mrs. J. Ginnan. Funeral Thursday 9:30 a.m. from his late residence 2722 Giddings st to Queen of Angels church. Interment All Saints. Member of Annunciation court No. 28, C. O. F. and Division 241 SERE of A. [S349] Killasser RC reg., Bapts., vol. 2, p. 256. Death*: He died in March 1963; Thomas P. Madden, dear brother of Sarah [Sally] Madden and Mrs. Paul [Cecille] Heidkamp; fond uncle of Paul, Thomas, William, Judy, Sally, Gene, and Mike Heidkamp. Member of University council, Knights of Columbus. At Coleman's 4611 North Lincoln avenue, after 7 p.m. Saturday. Funeral Monday, 9:30 a.m., to Our Lady of Lourdes church. Mass 10 a.m. Interment All Saints. In lieu of flowers, contributions to Sisters of Charity B. V. M. Dubuque, Iowa, will be appreciated. SU 4-8888. [S1676] Find A Grave, online http://findagrave.com, Thomas P. Madden, memorial ID 196981253, created by grave digger, created February 20 2019. Accessed March 3, 2019. 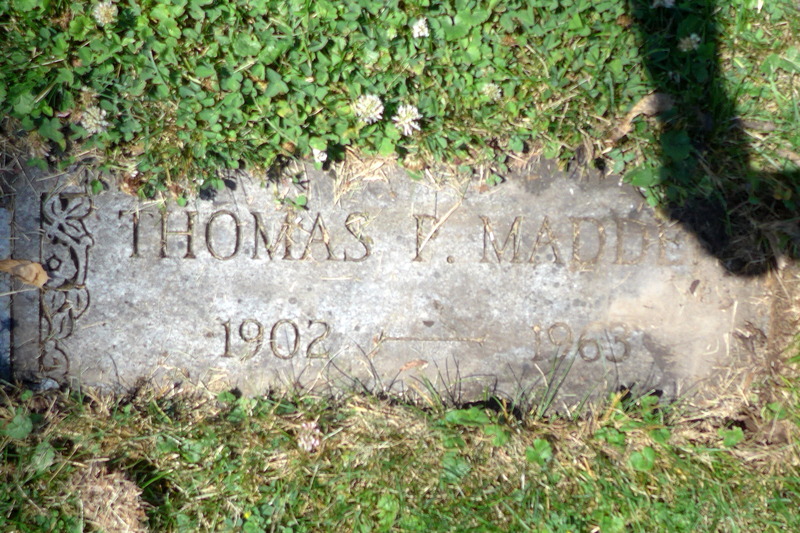 [S2508] Thomas P. Madden Cemetery marker, All Saints Cemetery, Des Plaines, Illinois. Death*: He died on 25 April 1942 at St. Anne Hospital, Chicago, Cook County, Illinois, USA, at age 62. William E. Madden, dearly beloved husband of the late Kathryn, fond father of Alice, brother of Mrs. James Shannon, Mrs. Michael Ginty, the late John, Patrick, Michael, and Mrs. Mary Ginnan. Funeral, Wednesday, April 29, at 9:30 a.m., from residence, 4745 Gladys avenue, to Resurrection church. Interment Mount Carmel. Member of P. B. A. [S1351] William Madden, Illinois Certificate of Death, Family History Library, Salt Lake City, Utah, MF# 1953743. [S851] Patrick Madden, Illinois Coroner's Certificate of Death, Micropublication #1893420, Family History Library, Salt Lake City, Utah. [S697] Chicago Tribune, November 20, 1932, Chicago Tribune Historical Archive; clipping. [S997] Annie Madigan, Madigan, Annie death certificate, Family History Library MF#1030983. [S997] Annie Madigan, Madigan, Annie death certificate. [S824] Baptisms 1855 - 1876, page 51, Bridget Madigan's Baptismal record: FHL# 1752990, Item 5, October 12, 1869, St. James Church. Death*: Clementine Madigan died on 4 June 1940 at St. Bernard Hospital, Chicago, Cook County, Illinois, USA, at age 59. McNally -- Clementine Madigan McNally, late of 7316 Prairie avenue, beloved wife of Sergt. Hugh F. McNally, loving mother of Hugh Jr., Robert, and Claire, daughter of the late Michael and Bridget, fond sister of Michael, Maurice, Tessie, and the late Mrs. Nora Carey, Della Hincks, James, and Thomas. Funeral Friday at 9:30 a.m., from funeral parlors, 7653 S. Halsted street, to St. Columbanus' Church. Interment Holy Sepulchre cemetery. Stewart 7700. [S1204] Clementine Madigan, Illinois Register of Births no 14762, FamilySearch.org, accessed May 26, 2010 (December 25, 1880). [S858] Clementine McNally, Illinois Certificate of death, Micropublication #1953579, Family History Library, Salt Lake City, Utah. [S897] Hincks-Madigan Marriage License: pilot.familysearch.org, accessed February 12, 2009. [S1754] Marriage Register 1887-1915: entry for Matthew Hincks and Della Madigan, October 31 1907 St. Leo the Great, Chicago, FHL# 1577894, Item 7, Salt Lake City, Family History Library. [S2030] 1920 US Census, Illinois, Cook County, Chicago, Washington, DC, ED 2003, roll 350, page 10B, Accessed March 23, 2015, Ancestry.com. Death*: Collette Madigan died on 25 June 1981 at Cook, Illinois, U.S.A., at age 71. SSDI states her last residence was Oak Lawn, Cook County, Illinois; her last benefit was paid to Hinsdale, DuPage County, Illinois. BINGEN - Coletta Bingen, nee Madigan, beloved wife of the late Joseph C; loving mother of Joseph M. (Sandra), Sheila (Joseph) Lamkin and Raymond (Elizabeth); devoted grandmother of Kimberly, Michael, Karen and Kelly Bingen, Courtney, Julie, Peter and Shawn Lamkin; fond sister of Raymond (Rita) Madigan and Marge (Peter) Murany. Former resident of Beverly and christ the King parish. At Kenny Brothers, 3600 W. 95th St., Saturday and Sunday 3 p.m. to 10 p.m. Funeral Monday 9 a.m. to St. Adrian church. Mass 9:45 a.m. Interment Holy Sepulchre. 239-3600. [S309] US Social Security Death Index, 1935-Current, Ancestry.com, Coletta Bingen, SS# 345-20-4610, accessed March 23, 2015. [S1346] Cook County Clerk's Office, online http://www.cookcountygenealogy.com, Joseph C. Bingen and Coletta V. Madigan marriage, File number: 1440194; accessed March 23, 2015. [S1346] Cook County Clerk's Office, online http://www.cookcountygenealogy.com, Coletta Bingen death, File number: 6013613; accessed March 15, 2015. [S2042] Chicago Tribune, July 13, 2005, www.chicagotribune.com, Accessed online March 24, 2015.